I heard this could happen - first time for me. 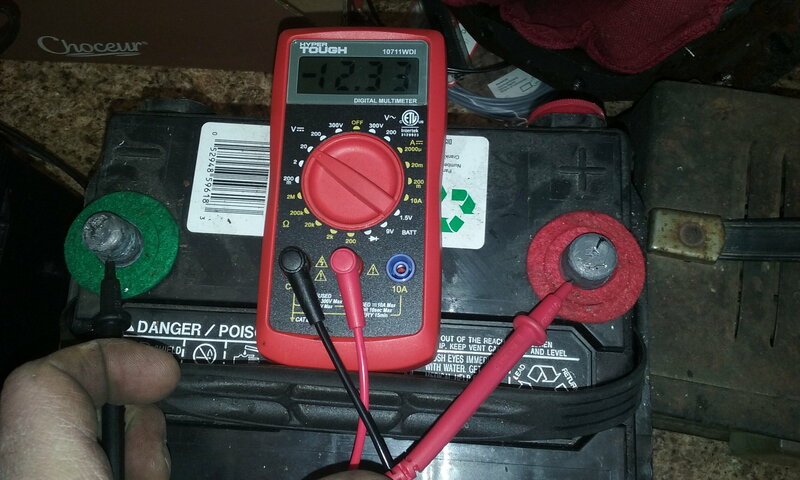 Always make sure you get the polarity right when charging a dead battery (don't hook it up in the dark). Let's see the full length of the leads, may we, sir? The half reactions show that both sets of plates become PbSO4 or Lead-Sulfate. A completely discharged battery would essentially be a "clean slate" that could be charged either direction (in an ideal scenario). But it is unlikely to have a completely discharged battery (0V). Plus special current control factors are required. Sorry, I only have two hands. I was lucky to get as good a picture as I did. There's no funny business going on with the leads though. In fact, I put this battery in my truck after mistakenly charging it backwards and sparks flew when I connected the cables. I found that if I disconnected the wire going to the alternator I could hook things up without sparks (can anyone here guess why that was?). Tried to start the truck and while it would crank just fine it wouldn't start. I checked the coil voltage and it was zero. That was when I put a meter on the battery and discovered the reversed polarity. Just for kicks I swapped the battery cables and tried again and it started right up. That was really weird watching that thing run with the battery connected backwards. So, like I said, I originally connected the battery to the charger in the dark thus getting it backwards and it was in fact a completely dead battery. I had hoped to bring it back to life with a long slow charge. Well I did bring it back to life, just not like I planned. Now I have a light connected to the battery in an attempt to completely discharge it again so I can try to flip the polarity back to normal. I just hope the battery survives all this since it seemed to be in decent shape once fully charged. You may have blown out a couple alternator diodes. Check for proper alternator operation after you get your battery sorted out. Somehow the alternator survived it although I'm sure it's life has been shortened to some degree. After I got it running I went ahead and pulled the battery (since I didn't see the point of letting it recharge again) and it ran fine on just the alternator. I'm lucky I didn't appear to do any damage to the engine either since after some thought I realized I must have been cranking the engine over backwards before I tried reversing the battery cables. You still need to check for proper alternator function. Have it tested for no a/c ripple and proper voltage regulating. I got the external regulator but yeah, good idea. I don't need to mess up the electronic ignition (it's a wonder I didn't already). Everything else on this thing is old school so they should be fine. I don't think it's possible to crank the engine backwards by reversing the polarity on a battery. BUT, I'm not a mechanic. I find it exceptionally hard to believe that the PCM and any other integrated circuits would possibly function properly what's the polarity reversed. Quick Reply: I heard this could happen - first time for me.